The Guardian Angels is the epic and tumultuous story of two star-crossed lovers who weren’t just soul-mates but were also each other’s protectors. The fates of Adi Mehta and Radha Deodhar are deeply entwined when within days of their first rendezvous they save each other’s lives. Despite their vast sociopolitical differences, they are drawn to an uncertain future fraught with contrasting ambitions, personas and ideologies.
. . . he is the son of a billionaire, she is the daughter of a socialist.
. . . he is quiet and unassuming, she is a firebrand and spirited. However, the unexplained phenomena ties them forever – whenever they are in peril, they are each other’s only saviors. Over the following two decades Adi and Radha live through hope and despair, joy and sadness, and try to decipher their relationship. As the truth of their bond is revealed, they must confront the true nature of love, and ultimately, their destinies. Rohit Gore was kind enough to send me the book for review and I had a lot of expectations from the book. I am happy to report that they were fulfilled. This is a book with a heart. You get immersed in the story and share the joys, anxieties and the pain of the protagonists as you read on. Rohit Gore writes with the ease of a veteran and succeeds in holding your attention throughout the lengthy tale of two completely dissimilar persons tied through bonds of friendship, empathy, love and twists of destiny that lead to both repeatedly helping and protecting each other. The story begins when they meet as young kids and follows their lives as they grow up passing through tumultuous times. This tale of star-crossed lovers is well conceived, well narrated and written with amazing verve and spirit. The language is crisp and pithy and many lines are worth quoting. Though a fan of Indian writing in English, I often chaff at the superficiality of many books I come across. 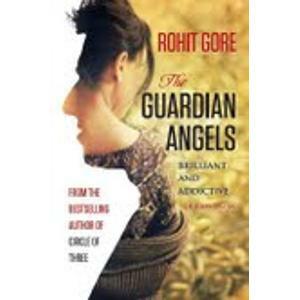 The Guardian Angels shows surprising depth and maturity and tends to stay in your mind long after finishing the book. Overall, The Guardian Angels is a wonderful tale which will keep you involved, entertained and leave you with a nice warm feeling in your heart. I would rate it at 3.5/5 and recommend it as worth reading. For online link to order the book click here.